The economic crisis years of 2008 and 2009 saw spectacular year-on-year increases in corporate insolvencies of more than 20%. Though business failures decreased by 16% in 2010, this improving trend did not continue in 2011. 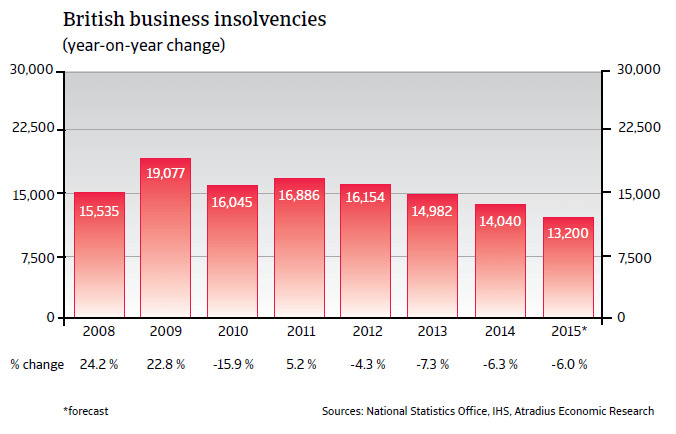 Since 2012, however, the number of business failures has been falling, and in 2014 the UK Insolvency Service recorded a 6.3% year-on-year decrease in compulsory liquidations and creditors’ voluntary liquidations in England and Wales, with 14,040 cases recorded. We expect this trend to continue in 2015, with business failures forecast to decrease by around 6%. However, this still puts the number of insolvencies slightly above 2007 pre-crisis levels at around 12,500 cases. The UK economy expanded by 2.6% in 2014, the fastest pace of growth since 2007. While consumer spending was the main driver, real fixed investments also increased. 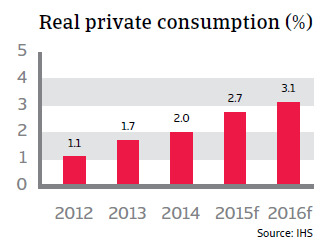 Given the continued robust performance of private consumption and investments in 2015, GDP is expected to grow 2.7% in 2015. Since 2013, consumer confidence has been boosted by the more optimistic economic outlook and a rebound in the housing market, with a return to rising house prices having a positive effect on household wealth. At the same time unemployment has further decreased to 6.2% in 2014. With improving confidence, higher house prices and decreasing unemployment, UK consumer spending is forecast to continue on its upward path in 2015, increasing by 2.7%, and stimulating growth. This trend is also helped by lower consumer price inflation, mainly due to lower oil prices, which has been steadily declining since the end of 2014 and is expected to decrease to 0.4% in 2015. This should improve household spending power as the rate of wage growth will finally outpace the rate of inflation after years of decline in real wages. 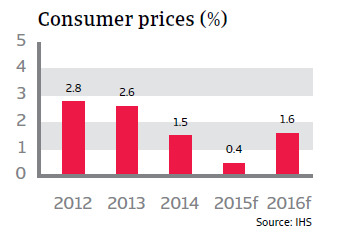 Increased household purchasing power will benefit retail sales, which are expected to increase 3.0% in 2015. There are some concerns regarding the low inflation rate, however it is not expected that the Bank of England will increase interest rates before early 2016; particularly since low wage growth is still restricting higher spending capacity. Business confidence remains elevated, and industrial production increased 1.4% after three years of contraction. Industrial production is forecast to increase 1.5% in 2015. 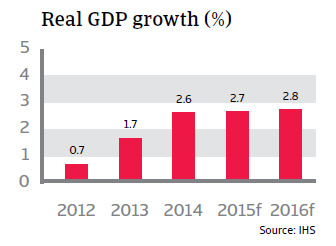 Real fixed investment is expected to increase 3.7% in 2015 after rising 6.8% in 2014. In order to sustain robust economic growth, the British government is aiming to rebalance the economy away from consumer spending and towards higher productivity and more exports. 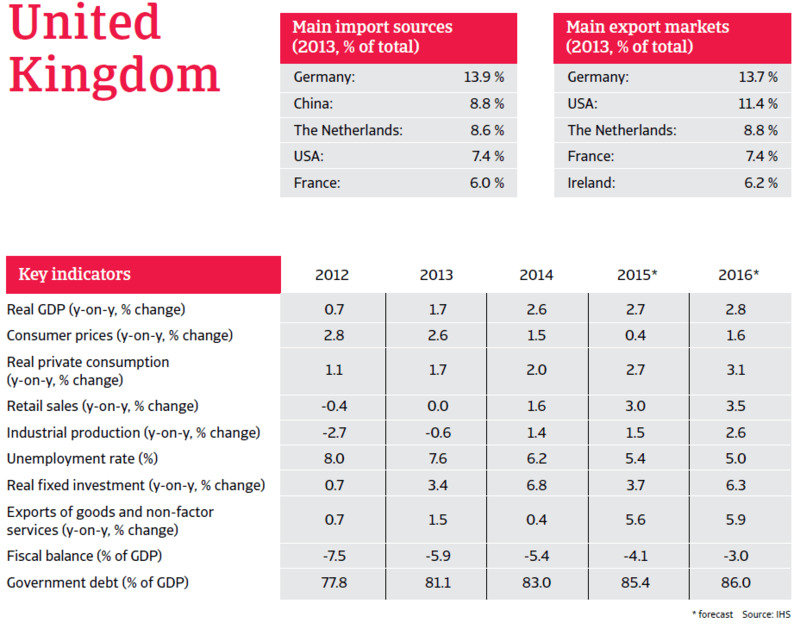 However, the United Kingdom remains a net importer. At the same time a side effect of the UK’s strong economic performance has been a steady rise of the pound since early 2013, and this trend has intensified due to weaker growth and expansionary monetary policy in the eurozone. A strong pound negatively affects British exports to the eurozone, which is still the UK’s most important trading partner, accounting for 42% of exports. Businesses that depend on exporting their products are adversely affected by the low euro as exports to the eurozone will be relatively more expensive, either reducing demand for UK exports or forcing British firms to reduce their profit margins. The 2008 credit crisis and the subsequent economic downturn pushed government debt up from 38% of GDP in 2007 to more than 75% in 2012. The fiscal deficit exceeded 10% of GDP in 2009 and 2010 as a consequence of the economic slump and the government’s investment in stimulus measures. 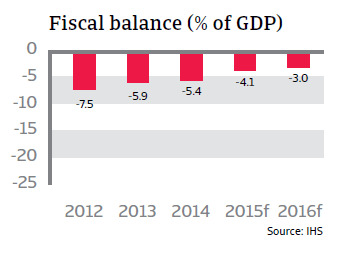 Comprehensive austerity measures and tax increases since 2011 have slowly reduced the fiscal deficit to 5.4% of GDP in 2014. However, government debt continues to rise and is forecast to be more than 85% of GDP in 2015. In the UK, consumer confidence and discretionary income have shown significant improvement over the past 12 months. The overall trend in consumer durables retail performance has been an improving one.